Found in the south west of Switzerland, Verbier is one of the largest ski holiday resorts in the whole of the Swiss Alps. Verbier is a part of the ski area known as the ‘four valleys’, an extensive collection of resorts which also include La Tzoumaz, Nendaz and Veysonnaz. Located in the Swiss canton of Valais, the village of Verbier is home to around 3,000 residents. The popularity of the resort needs no exaggeration; the number of people staying in Verbier is estimated to rise to around 35,000 during the winter! Here is a guide to Switzerland’s Ultimate Luxury Ski resort. The resort’s skiing area is split into four sectors, and Verbier is found in the western part of the 4 valleys ski zone. The Swiss mountains provide some of the best skiing in Europe and it has even been said – the world. Verbier caters for everyone: from children at the very beginning of their skiing adventure, to the ski and snowboard veterans, who are looking for their next big challenge. For families and the less experienced visitors, Verbier has an abundance of support and guides. Learners at any level can book themselves individually, or as a group, into one of the seven snow sport schools at the resort. For those who are looking for a more extreme experience, the resort is famous for being one of the world’s best places to experience ‘off-piste’ skiing. Despite the danger that off-piste skiing poses, the thrill and challenge is unparalleled. Experts can take advantage of Verbier’s unique claim to ‘Mount Gele’, one of the few resort mountains without any pistes on its slopes. 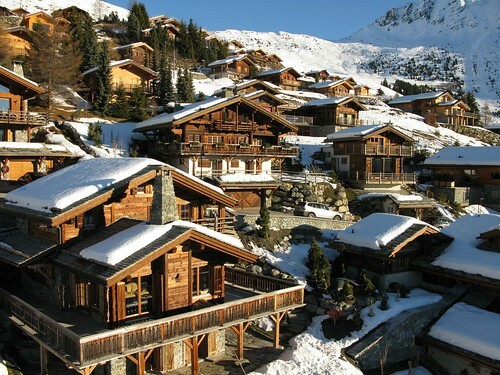 Verbier has a wonderful range of luxury hotels and lodgings to suit every visitor. The ultimate ski resort is well equipped with the ultimate places to stay during the night. Perhaps the most amazing part of your hotel, however, will be the window! The views and landscapes surrounding Verbier are nothing short of breath-taking. The village is surrounded by incredible panoramic views of the Alpine mountains, picturesque landscapes that stretch for hundreds of miles. For an unprecedented lookout in 360 degrees, those who reach the top of Mont-Fort can see some amazing sights. The highest mountain in Europe, Mont Blanc, is visible from Verbier’s peaks as you look out to the east. From the top of Mont-Fort, visitors are also presented with the incredible sight of the Matter-horn, as they look out to the west. If a day on the slopes and the stunning views in Verbier’s mountains don’t take your breath away, then the fine food in its restaurants surely will. Grab yourself a free pocket guide when you arrive in the village, and pick a place to eat from the wide selection. Verbier has a brilliant range of Swiss specialities, and fine dining from around the world. The resort is famously home to the ‘Chalet d’Adrien’, which has earned a Michelin star for its outstanding quality of cuisine. The 5 star gourmet restaurant is sure to tickle your taste buds and give you a taste of the high life with its menu. There is a great range of places to eat and drink, and most hotels will offer 5 course meals to their temporary residents. Many reviewers have recommended the Nevai Hotel for its excellent dishes. Verbier is host to some great evening entertainment venues, with a very famous nightlife in the resort village. Young skiers can take a break from the snow, and enjoy the social side of one of the most popular resorts in the world today. The resort has achieved its luxury status because of the quality of entertainment and nightlife it provides, even celebrities have taken notice! Famous faces such as Virgin boss Richard Branson, the Swedish Royal Family, James Blunt and Diana Ross have all enjoyed this Swiss luxury ski resort. The bars and social clubs are well known for their vibrancy, and great atmosphere but hitting the nightlife, however is not the only thing to do after a hard day on snow. The resort has a great abundance of chalet-style buildings and wonderful range of boutiques and hotels can be found around the Place Centrale, adding a certain elegance to the town. Verbier has well and truly earned the right to be called the Ultimate Luxury Ski Resort. Switzerland is one of the best countries in the world for skiing, snowboarding, and a whole host of winter sports. With world-renowned Après-ski, incredible views, and the finest dining in the whole region, it’s easy to see why the resort is so popular. Whether you’re looking for an extreme skiing adventure, or a fun experience for the family, Verbier should be the next place on anyone’s list of resorts to visit. Written by Nathan Griffiths an avid travel writer and lover of skiing.